Styrene is one of eight new substances listed in the 12th Report on Carcinogens, released June 10 by the U.S. Department of Health and Human Services, despite objections by the National Marine Manufacturers Association and a coalition of groups that say there was not enough scientific evidence to support such a listing. The designation, the NMMA points out, carries no automatic regulatory implications, but it can be cited in federal and state regulatory decision-making. Of the other new substances in the report, the industrial chemical formaldehyde and a botanical known as aristolochic acids are listed as known human carcinogens. Six other substances — captafol, cobalt-tungsten carbide (in powder or hard metal form), certain inhalable glass wool fibers, o-nitrotoluene, riddelliine and styrene — are added as substances reasonably anticipated to be human carcinogens. With these additions the 12th Report on Carcinogens has 240 listings. Jack Snyder, executive director of the Styrene Information and Research Center, says he was “profoundly disappointed” by the decision to include styrene in the report. “We think that it was a very poor decision, and we have fought for three years what we think is a very untransparent and poorly supported decision,” he says. “We had hoped that Secretary [Kathleen] Sebelius would seek some outside confirmation of the concerns that we raised. “We certainly will appeal it, and we do intend to address it legally, too,” he says, adding that his group may also request a rereview in the next report, which could come out as early as 2013. Styrene is a clear, colorless liquid that is used to make thousands of products, from packaging and containers to recreational equipment. John McKnight, director of environmental and safety compliance at the NMMA, says styrene is one of two essential components in the composite resin used to build boats. Styrene acts as a cross-linking agent and a solvent when combined with liquid resin. It is the catalyst in what is called an exothermic reaction that, when combined with the resin, creates a new chemical called unsaturated polyester resin, McKnight says. Unsaturated polyester resin is the solid material that makes up the hull and deck of a boat and is reinforced with fiberglass. “At this time no other material can provide the same high-performance characteristics, quality and cost-effectiveness of styrene,” McKnight says. “Styrene is widely used because it has been substituted over the years for other materials to create stronger and lighter, more efficient products.” The widespread application of styrene-based, fiberglass-reinforced plastics also is credited with making boats more affordable, he says. There is no styrene in a finished fiberglass boat, says Jeff Gabriel, legislative counsel for the NMMA. “There is no styrene after the fiberglass hull sets in the factory. So before they even start putting in tubing and electric wires and actually finishing it so it looks like a boat — long before that happens — there’s no more styrene. It’s gone; the chemical reaction is over,” he says. 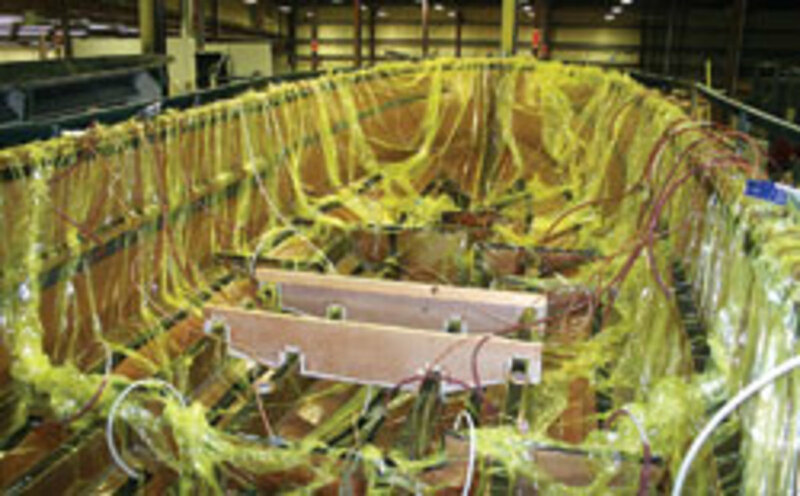 McKnight says workers involved in gelcoating and resin application in a plant that builds fiberglass boats are protected from exposure to styrene because the plants are required to meet an Occupational Safety and Health Administration exposure level of 100 parts per million over an eight-hour period. In 1998, NMMA, the American Composites Manufacturers Association and the Styrene Information and Research Center signed an agreement with OSHA that said NMMA and ACMA members would meet a 50-parts-per-million exposure level to provide an adequate level of safety based on exposure studies. McKnight says boatbuilders limit styrene emissions exposure with protective gear, monitoring equipment, ventilation systems and enclosures around work processes. 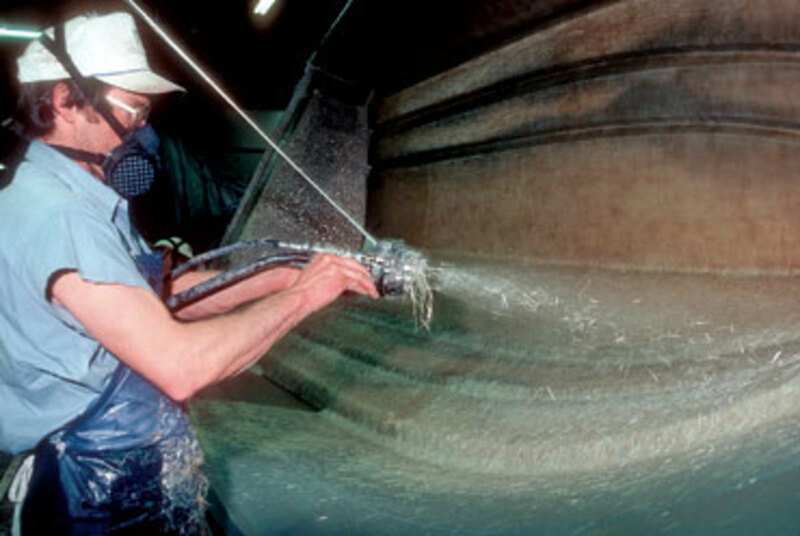 Respirators are used in gelcoat facilities. McKnight says the health of workers in all manufacturing facilities using styrene, including boat plants, has been monitored for 45 years, and he says studies that looked for long-term health effects related to styrene exposure examined the health records of more than 50,000 workers who were exposed to it. “The studies have not shown statistically significant increases in long-term health problems of any kind attributable to styrene exposure,” he says. The NMMA, SIRC and other groups have been trying to prevent the listing since 2004, public records show. Other groups submitting comments against the listing include the ACMA and the International Institute of Synthetic Rubber Producers. In a June 2008 letter that the NMMA submitted as part of public comment on the matter, McKnight notes, “NMMA and its boatbuilder members who are exposed to styrene every day firmly believe that it is not a human carcinogen. “Boatbuilders have been using styrene monomer to build fiberglass boats for over 50 years. In recent years boatbuilders have begun using new application technology and lower styrene resins as a way to reduce emissions into the environment and reduce worker exposure. Most boatbuilders are small family businesses where the workers are considered part of the family and the owners spend a considerable amount of time on the factory floor,” he writes. In May, 63 members of the U.S. House of Representatives called on Sebelius to delay the proposed listing until a “thorough review can be conducted that weighs the full body of scientific evidence available to decision makers.” The letter was co-sponsored by Reps. Jason Altmire, D-Pa., and Joe Wilson, R-S.C. But when Walmart pulls baby bottles off the shelves of its stores the public assumes BPA is bad, Gabriel says. “All manufacturers should be prepared to confidently address any questions that might arise from their local community,” Grady-White president Kris Carroll says.